Our previous post explained how to scan photos with iPhone or iPad and Pic Scanner Gold app. But how about film negatives and Kodachrome slides? Well, Pic Scanner Gold is not a negative scanner app, but if you have film negatives of old photographs, here is a neat trick to view them as positives, using just your iPhone and iPad! No app needed. Have a box or envelope of negative film strips lying at home? Curious what they contain? Maybe you’d like to select and print photos from them? You need a light source to uniformly illuminate the negatives from behind. “Uniformly” is important, so unless you are into photography gear and have a proper light box, you must rig up something simpler. An iPad will do the job splendidly. If you don’t have an iPad, you could use your computer screen (or, push come to shove, TV screen). Whether using iPad, laptop or TV, increase screen brightness (On iPad: Settings > Display & Brightness). Now you need to get a blank white screen. On iPad or laptop, open Notes app > New. On TV, find an empty channel. Place film negatives on the screen. This will light them from behind. You’ll use your iPhone to see the film negatives. On iPhone, go to Settings > General > Accessibility > Display accommodations > Invert colors. It’ll now display all colors inverted. This might be a bit startling, but don’t worry – you want to view the film negatives as positives, i.e. invert them. On the iPhone, launch Camera app. Hold the iPhone above the illuminated film strip, tap to focus, and there you are! You will see the positives of your photographs. This is because the white balance needs adjusting. To remedy this, go to Settings > General > Accessibility > Display Accommodations > set ‘Color Filters’ to ‘on’, and choose Greyscale. The display will now be B&W, but you’ll still be able to see the photos a lot better. When done, remember to return the accessibility option changes to their original settings. The above method will let you view your film negatives, but it’s not suitable for scanning them. The resolution won’t be good. Scanning film negatives requires special equipment e.g. an appropriate, powerful illumination source to back-light the film, and a stand to hold the camera still. Even then, scan quality won’t be very good. 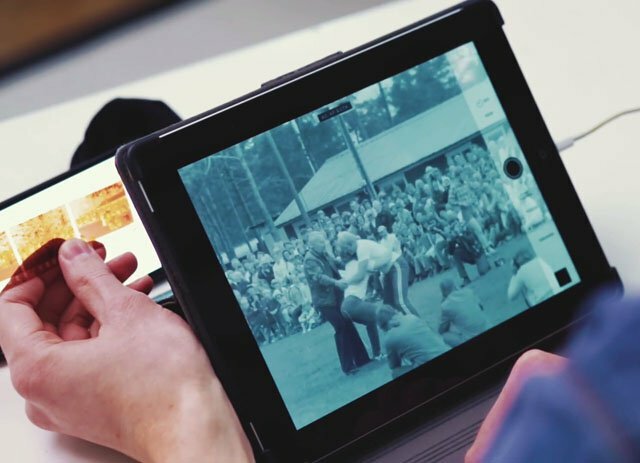 We have tested some slide and film scanner apps, but the results were uniformly disappointing. We would suggest using a film scanner or a flatbed scanner with a slide adapter. Or a slide scanning service (If you live in North America, try Walgreens or Costco. Some of their outlets offer this service). For more details, see this Petapixel article and video. If you have film negatives, you must also have old, printed photos. Scanning is a great way to preserve them. It also makes them shareable. The easiest and fastest way to scan photos is with Pic Scanner Gold app. It turns your iPhone or iPad into a powerful, high resolution photo scanner. 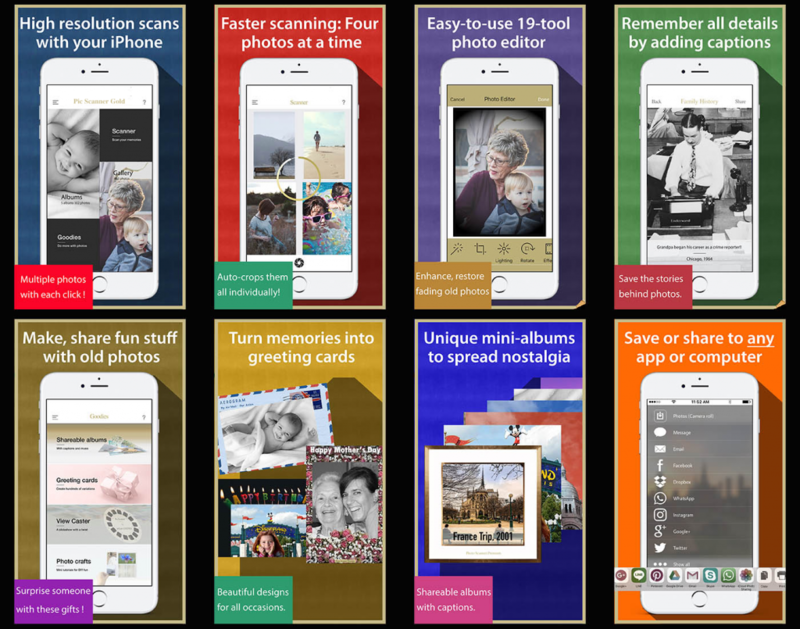 This app lets you scan multiple photos at a time, and automatically detects, crops and saves them as separate images. You can enhance and restore fading photos, make them into albums, greeting cards or slideshows, add captions (names, dates, places etc.) You can also share photos with family and friends, or archive them on your computer or in a cloud service. Pic Scanner Gold has an amazing array of built-in features, and it has received praise from Cult of Mac, National Geographic Traveler, the BBC, iPad Insight, Gizmodo and many other respected publications. For users with older devices (iPhone 5, iPad 3 or older), our classic app Pic Scanner is recommended.